Alice through the Looking Glass may represent Disney’s first big-budget failure in quite some time. More likely to inspire thoughts of Michael Bay than Lewis Carroll, this sequel to Tim Burton’s 2010 Alice in Wonderland borrows sparingly from the Carroll novel with the same title, opting instead to use Linda Woolverton’s confused and incoherent story as its basis. The movie is frequently incomprehensible and, on those occasions when it makes sense, the viewer may wish it didn’t. Visually, Alice through the Looking Glass has its moments but pretty backgrounds and clever special effects can’t obscure the disappointment resulting from a half-baked script and a miscast villain. Alice through the Looking Glass begins an unspecified time after the end of Alice in Wonderland. Back in the real world, Alice (Mia Wasikowska) has been spending several years as a sea captain. After an improbable escape from pirates, she returns home in seeming triumph, only to learn that, in her absence, her father’s business has been sold out from under her. In that moment of despair, she is lured back to Wonderland, where all of her old friends are waiting for her. But there’s a crisis. 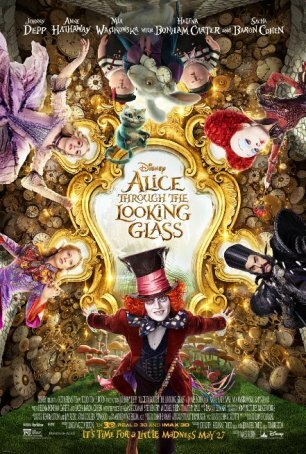 The Mad Hatter (Johnny Depp) is acting more mad than usual and Alice learns that, in order to “fix” him, she must locate the Chronosphere, a time-traveling device jealously guarded by Time (Sacha Baron Cohen), and discover the truth of what happened to the Hatter’s family. Time, however, is allied with an old enemy of Alice’s: The Red Queen (Helena Bonham Carter), who remains devoted to engineering the downfall of both Alice and her sister, The White Queen (Anne Hathaway). As if all that wasn’t bad enough, the movie decides it’s a good idea to italicize the fact that Alice, despite living in the 18th century, is a modern woman whose worldview and ideals match those of someone born more than 100 years later. I’m all in favor of strong women characters but if one is going to make a period piece, some care has to be taken about meshing the concept of “female empowerment” with the views of the day. Alice could have shown her strength through her actions (which she does, at least to an extent). Adding lines to the screenplay that instruct us about this is unwarranted. Then there’s Sacha Baron Cohen, who apparently thinks he’s in Monty Python’s Life of Alice. Wow. Cohen’s attempt to blend slapstick humor with sinister intentions is distracting and off-putting. Compared to his performance, Johnny Depp comes across as restrained. Director James Bobin lacks Burton’s skill when it comes to effectively incorporating weird ideas and characters, and it’s hard to find a more discordant example than Time. The decision to add an army of bumbling droids to the proceedings as a means of amplifying the comic relief is a step further in the wrong direction. I wish I could offer a more upbeat assessment of what is easily Disney’s worst high profile motion picture in years. The success of Alice in Wonderland made the sequel a necessity and Carrol’s writings provided a template that, if deconstructed and reworked, could have resulted in a worthy second chapter. Instead, Linda Wolverton chose this path and the result speaks for itself. I’m not sure who this movie was made for. Not little kids - it will be too confusing and at times too scary for them. Not older viewers, who will find the time travel paradoxes poorly developed and the action sequences tedious. 2010’s Alice in Wonderland was a pleasant surprise and enjoyable diversion. Let’s just pretend that, in 2016, Alice just looked at herself in the mirror and never stepped through.